Born in the Saguenay Lac St-Jean in 1965, Sacha now lives and works in Montreal. 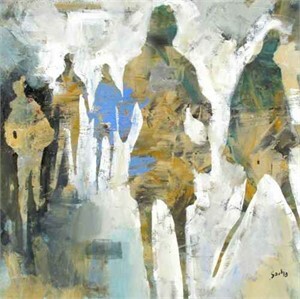 After obtaining a Bachelor’s degree in Graphic Design from Université du Québec à Montréal in 1982, Sacha worked for a number of advertising firms and taught private art classes. As his love for painting evolved, he decided to devote himself entirely to the pursuit of his passion. 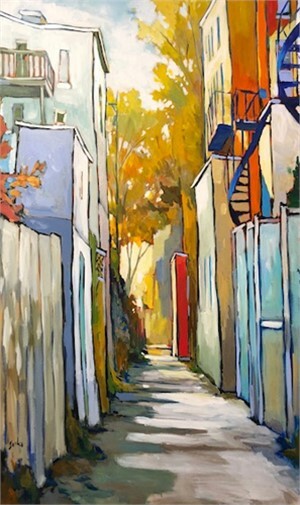 Sacha’s travels throughout Canada, the United States and Latin America greatly influenced his art practice, transforming his palette to include an impressive array of ochre, burnt orange, burgundy and vibrant blue. The paint is applied generously to the canvas and the colours are left pure in order to give each subject its unique shape, texture and light. The artist’s innate curiosity led him not only to journey through new lands and territories, but to explore a variety of styles and themes. 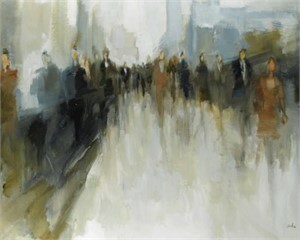 Whatever the subject, Sacha’s paintings are executed with equal confidence and passion. Today, his work is exhibited in galleries throughout North America. 2000 Artistic director of twelve public murals illustrating scenes from Quebec’s Charter of Rights. The project, Tout ce qui nous différencie nous rassemble, was completed thanks to the collaboration of Art-Mur and theMinistry of Immigration. 1997 Participates in a series focused on Chili’s culture, “Centre multicultural – La Fondation Victor Jara” in Santiago, Chile. 1996 Illustrates the book L’Histoire de Nelson, written by Joan Lalancette, édition d’art La Sauvagine. 1994 Teaches visual arts with his wife in a private school located in the State of Oaxaca, in Mexico. Creates a fresco in a dome for Mr. Santibanez. 1992 Meets with the film-maker Guido Lombardi and executes five painting of scenes taken from the set of the movie “Vandetta”. 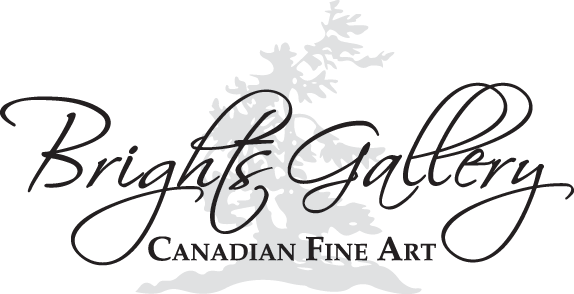 Gives private painting classes in the Outaouais region. 1988 Associates himself with the reknown comic strip creator Prouche to complete a comic strip based on the history of Alphonse Desjardins. 1985 Teacher’s Assistant in a drawing course in graphic design at the Université du Québec à Montreal for the professor Maurice Macot. Creates a comic strip for the Comic Strip by Computer Forum in Ghand, Belgium. Born in the Saguenay Lac St-Jean in 1965, Sacha now lives and works in Montreal. After obtaining a Bachelor’s degree in Graphic Design from Université du Québec à Montréal in 1982, Sacha worked for a number of advertising firms and taught private art classes. As his love for painting evolved, he decided to devote himself entirely to the pursuit of his passion. Sacha’s travels throughout Canada, the United States and Latin America greatly influenced his art practice, transforming his palette to include an impressive array of ochre, burnt orange, burgundy and vibrant blue. The paint is applied generously to the canvas and the colours are left pure in order to give each subject its unique shape, texture and light. The artist’s innate curiosity led him not only to journey through new lands and territories, but to explore a variety of styles and themes. 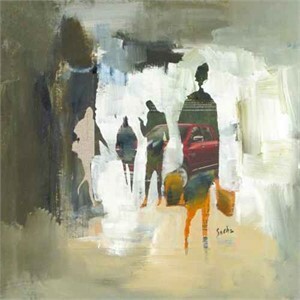 Whatever the subject, Sacha’s paintings are executed with equal confidence and passion. Today, his work is exhibited in galleries throughout North America. EXHIBITIONS 2007 State of the Arts Gallery, Toronto, Canada (solo exhibition) 2004-01 Pavillon des Arts de Ste-Adèle, Québec, Canada (solo exhibition) Galerie Époque, Aylmer, Quebec, Canada (solo exhibition) 2002 State of the Art Gallery, Toronto, Canada Art and Soul Gallery, Indianapolis, United States 2001 Art Expo New York, New York, United States 2000 State of the Art Gallery, Toronto, Canada 1999 Art Expo New York, New York, United States 1998 Exhibition in Mexico City La Tournée des Vingt, presenting twenty artists of the Brome-Missisquoi region, Quebec, Canada Galerie Époque, Aylmer, Quebec, Canada (solo exhibition) Le bateau lavoir, Centre d’art contemporain de Montréal, Canada Le Belgo, Montreal, Canada 1997 Festivart, Frelighsburg, Quebec, Canada Galerie Époque, Aylmer, Quebec, Canada (solo exhibition) 1996 Artistes Associés, Val-David, Quebec Galerie Époque, Aylmer, Québec, Canada (solo exhibition) L’Association des peintres professionnels du Québec, Montréal, Canada 1994 Galerie d’art Jaccar, Aylmer, Quebec (part of the permanent exhibition) 1993 McDonald Club, Ottawa, Canada La Petite Maison des Arts, Montreal, Canada 1992 La Boutique d’art d’Outremont, Outremont, Canada Mouvement Pinceau, Montreal, Canada Vues sur Montréal, Galerie d’art Le Néoniste, Montreal, Canada 1990 La Maison de la culture de Rivières des Prairies, Canada 1988-89 Duo with painter Arthur Villeneuve, Place des Goélettes, Chicoutimi, Galerie d’art L’Imprévu, Montreal, Canada 1987 Le Groupe des Arts, Montreal, Canada Galerie d’art Le Néoniste, Montreal, Canada ACCOMPLISHMENTS 2000 Artistic director of twelve public murals illustrating scenes from Quebec’s Charter of Rights. The project, Tout ce qui nous différencie nous rassemble, was completed thanks to the collaboration of Art-Mur and theMinistry of Immigration. 1997 Participates in a series focused on Chili’s culture, “Centre multicultural – La Fondation Victor Jara” in Santiago, Chile. 1996 Illustrates the book L’Histoire de Nelson, written by Joan Lalancette, édition d’art La Sauvagine. 1994 Teaches visual arts with his wife in a private school located in the State of Oaxaca, in Mexico. Creates a fresco in a dome for Mr. Santibanez. 1992 Meets with the film-maker Guido Lombardi and executes five painting of scenes taken from the set of the movie “Vandetta”. 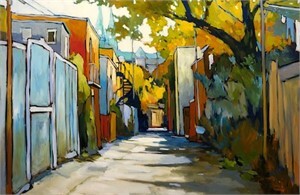 Gives private painting classes in the Outaouais region. 1988 Associates himself with the reknown comic strip creator Prouche to complete a comic strip based on the history of Alphonse Desjardins. 1985 Teacher’s Assistant in a drawing course in graphic design at the Université du Québec à Montreal for the professor Maurice Macot. Creates a comic strip for the Comic Strip by Computer Forum in Ghand, Belgium.